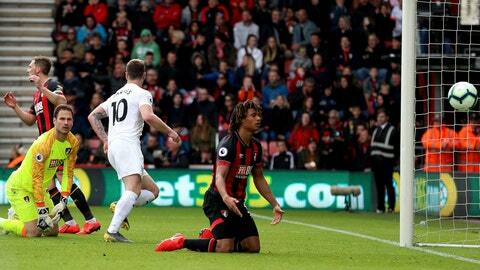 BOURNEMOUTH, England (AP) — Burnley took a big step toward preserving its Premier League status with a 3-1 win at Bournemouth on Saturday. With five remaining games, Burnley moved up to the relative safety of 14th to sit eight points clear of danger. An afternoon that had begun disastrously with Ashley Barnes‘ early own-goal ended with Sean Dyche’s team moving two points behind 13th-placed Bournemouth, whose poor form is undermining its fine start to the season. Barnes even scored the Clarets’ third goal after Chris Wood and Ashley Westwood had given them the halftime lead.